Or should that be Z to A? Whatever – when Aston Martin and Zagato collaborate on a car, wonderful things happen…. Behold the Aston Martin Vanquish Zagato Speedster. The relationship between Italian styling house Zagato and Aston Martin began in 1960 with the Aston Martin DB4 GT Zagato, but its stunning looks didn’t manage to sell out the planned 25-unit production run. Despite this, the last DB4 GT Zagato to sell at a public auction was purchased by its new owner for £9.45 million…. Aston Martin publically revealed the Vanquish Zagato Volante in Carmel, California on the 15th August during Monterey Car week – the global epicentre of classic car collecting. They also confirmed production of Speedster and Shooting Brake versions of the car. Just 325 Vanquish Zagatos will be manufactured in total – just 28 Speedsters (all now sold) and 99 of each of the other variations. Wrapped in a stunning carbon-fibre body, the Vanquish Zagato Speedster’s twin speed humps represent the double-bubble roof design that is the styling house’s trademark. 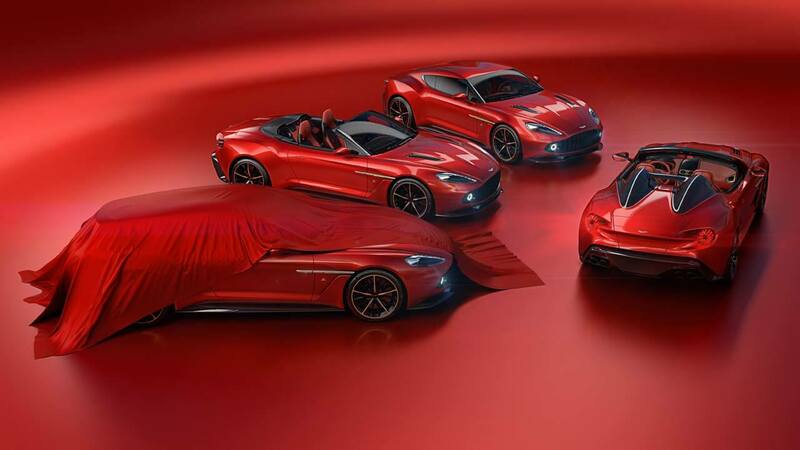 This is the first time that Aston Martin have released Zagato models as a family, although the two companies have collaborated on related cars before – the DB7 Zagato and its roofless sibling the AR1, and the V8 Zagato coupe and Volante (see our gallery below). With looks like that and the Zagato name, these cars will undoubtedly be highly sought after. Talent is….. designing the world’s most beautiful tail-light.